At Garage Door Service and Repair Inc, we hire certified techs to do professional work. This has earned us the respect of those we have served. Many people prefer the use of automatic doors in their garage. The convenience is too good to pass up. You can pull in your driveway, push a button, and your garage doors open. Push a button and the door closes behind you. Unfortunately, sometimes you push the button and nothing happens. Or the door stops halfway through the process. If this happens to you, contact us for automatic garage door repair in Houston, Texas. You need automatic garage door repair. What can we do for you that sep arate us from the other companies? For one thing, we are committed to same day repair service. Some repair needs allow you to open your door manually. Some repair needs do not. We hire pros that know the difference. They will detect the problem and fix it right. Customer care is a driving force in our company. Therefore, every tech must provide friendly, respectful, and professional service. Each tech must have the right experience and qualifications. They must be trained to fix any problems with your Houston automatic garage door. The opener is the defining component of the automatic door system. Without it, all you have is manual operation. All openers are equipped with a drive motor. It may be a screw, chain or belt drive. All of these motors have the same job to do: open and close your garage door. If yours stops working, reach out to us for automatic garage door opener repair. The techs we work with can fix all brands. Your opener will be up and working right in quick time. We offer all aspects of automatic garage door service. This simply indicates that we’ll send a pro to fix, install, maintain or repair any garage door brand. It is our job to make sure your garage doors open and close automatically. 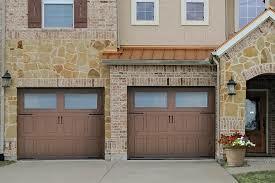 Turn to us and receive reliable Houston automatic garage door repair today. Let us send a pro to treat you right.